This year's Camp Retz was a little more eventful than I would have preferred. As the boys get older and stronger and more adventurous, the harder we (Jimmy and and his brother Steve) have to work at keeping up to their level. This is their friend catching air. 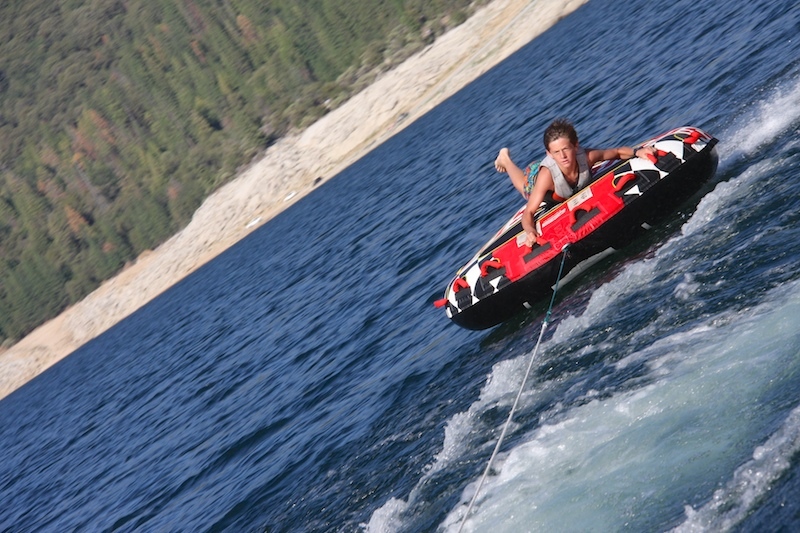 Normally when you're on a tube behind a boat, the fun is hanging out back there and go as fast as you dare, but for the most part, just enjoying the ride. It's still like that with the youngest nephew. But the goal with the oldest nephews, who are now 12 and 14, is to whip them around back and forth as sharply and quickly as possible to try to dump them into the lake, while they try their hardest to hang on. Reggie is 5'11" now, so it's gotten easier to dump him because he's taller and his weight works against. It's still very challenging because he's an athlete and is really strong and fast. 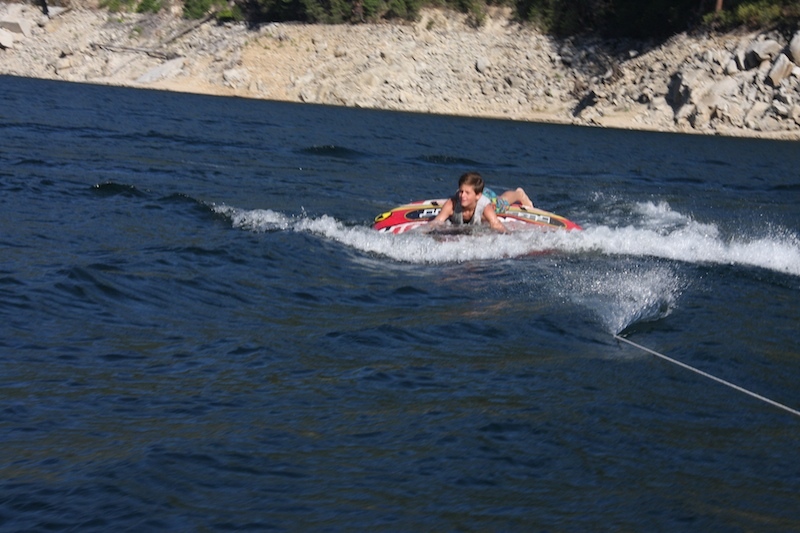 But Jakee is still nimble and small enough to be able to maneuver himself on the tube very quickly, adjusting his weight to the sharp turns. This year, we were towing Jakee behind the boat, and did a sharp turn and hit our own wake at the perfectly wrong angle and within split seconds, the boat was upside down. Thankfully everyone was fine. No injuries at all. My biggest panic as i was under water, was the boys. We had 2 boys on our boat, Reggie and his 15 year old friend. Jimmy was piloting the boat, and I was facing backwards taking photos of Jakee. It's funny the different perspectives we all have. I was sitting on the side that went in first, and it was sooo sooo fast. I didn't even know it was happening because I was concentrating on taking photos of Jake. The next thing I knew, I was in the water under the boat. Jimmy and the boys said it felt like slow motion as their side of the boat slowly flipped over. The boys were in the front of the boat and they jumped/dove into the water away from the boat as it was flipping. Thank God! They were never under the boat, which is such a huge relief to me. Jimmy's side flipped over me, but we never saw each other under there. He said he felt the railing and just pulled himself out from under the railing and was out. I had to crawl my way out from under. I was told I was the last one to come up. I was never worried that I wouldn't get out or drown, but I was definitely on survival instinct because I needed to make sure the boys were ok. That was all I could think of while i was under water...get out to make sure everyone is ok. I'm pretty sure as I surfaced, I took count, saw everyone, and asked "is everyone ok??" And they all were. Jakee was the safest since he was quite a distance from the boat. He thought he just fell of the tube like usual, and never saw any of the action ahead of him because it all happened as he was falling off. When he looked up, he didn't see the boat and was super confused before realizing the boat capsized. This is the last photo I took. 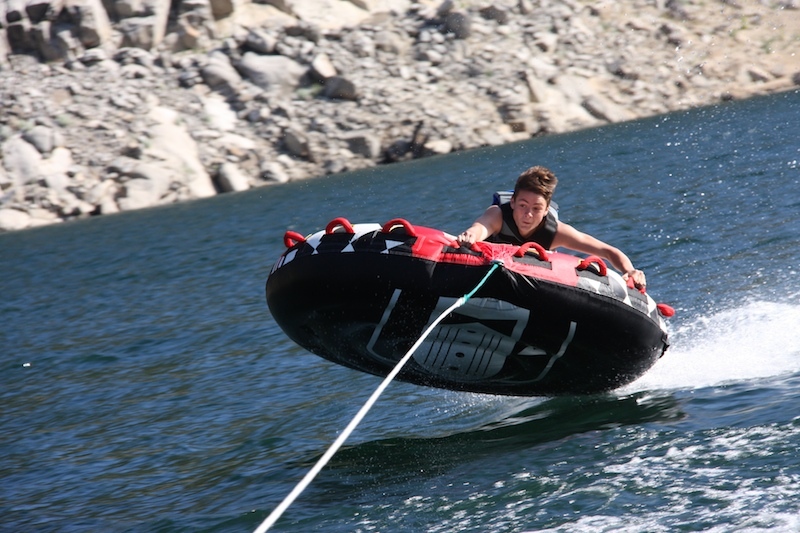 You can see the water overloading the front of Jake's tube, which made him fall in. 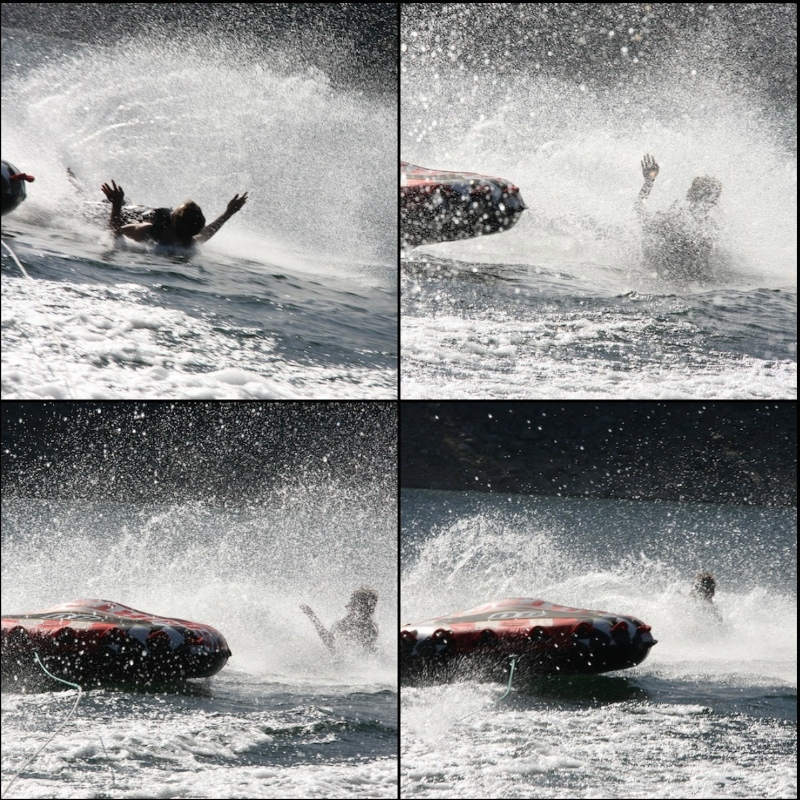 I was snapping photos as the boat flipped. The youngest nephew was on shore with his mom and dad. They saw it all happen and Steve immediately got in his boat to rescue. I can't imagine what they thought as they watched the boat flip. He was there within 90 seconds. When he got to us, we were laughing and retelling our stories. He was very happy to see all of us fine and even joking around. The boys quickly got onto his boat. Jimmy, Steve and I assessed what might have fallen to the bottom of the lake and what was crucial to recover. Like the keys to the car. Which I thought for sure were at the bottom of the lake because they were in my backpack, but we were relieved to find it floating under the boat. We hooked our boat to Steve's and towed it to the dock. It was very challenging towing it because of the drag. It pulled Steve's boat in unexpected directions making navigating difficult. But we finally got it there. Reggie, Jakee and their friend went to get Max and Danny and all of our stuff from where we camped out for the day. 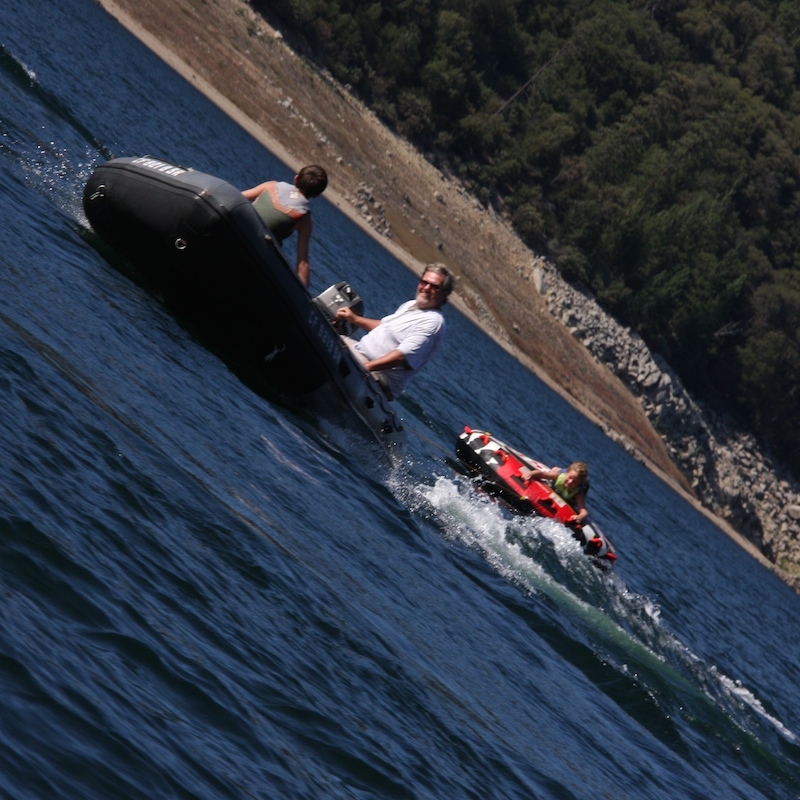 In the meantime, Steve and Jimmy and 2 helpful strangers tried to upright our boat. It took a while, but they finally got a heavy duty recovery strap, hooked it to the hitch on our car and the far side of the boat, and got it upright. We did lose a few things, and my camera and cell phone were damaged beyond repair, but the only thing that mattered was that everyone was ok.
And the boys had a great story to tell when they went back to school in August. Here's a video from the GoPro that was attached to the back of the boat. It was filming the boys on the tube. We don't have any photos of the tow back to the dock, or uprighting the boat, because...well...my camera and cell phones were both water logged. I was able to recover the photos from the camera card though, so yay for that! We've definitely learned a lot from this. We had the best outcome for something that could have been so much worse, and for that I am eternally grateful. The boys realize it was a big deal, not just another adventure. It was an actual boating accident. And we'll be piloting the boat more cautiously. And remember to always wear your life jacket. Crikey, you mad fools! I am so happy that you are all OK, that could have been a disaster as you well know. And I am astonished that the camera kept on filming while it was underwater. No life jackets in that second picture?